In addition to being beautify, watering globes are great for keeping your plants watered and healthy when on vacation, or for providing constant soil moisture for senstive or extra thirty plants. The following are some tips for the use and care of these handy gadgets. 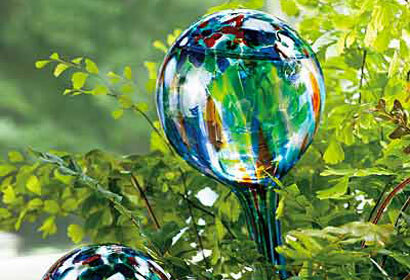 Those beautiful Glass watering globes, or watering bulbs, can be handy when you leave for the holidays. They are great for duration lasting from 4 to 6 days but be careful relying on them for longer periods. Multiple factors affect the rate of water flow as explained below in frequency between filling. Watering globes are primarily designed to moderate the amount of water plants receive. The "set it and forget it" convenience factor is a secondary benefit, so be careful not to rely on it exclusively for the general caring of your plant. Globes administer a steady dose of water that is absorbed as your soil dries out, which provides a more constant moisture balance. This avoids waterlogging of the plant or the other extreme of the soil becoming bone-dry between watering. The globe helps moderate the water that the plant receive. There is no set time between refilling, so be careful of over-zealous advertizing. The rate of water flow depends on your soil. Globes can last two weeks in some soils and only a few days in othersl. The frequency of refills depends on the size of the glass watering globe, the size of the pot, the type of soil and the type of plant (some plants are more thirsty than others). Its best to try it. You will eventually get a sense of how long it lasts for the specific case. If your plants wilt easily between watering, this watering system can help. Some plants are more thirsty than others and the size of the pot can also contribute to the speed at which the soils dry. Using watering bulbs for these application can be effective in mainting moisture balance. Make sure the soil is damp, then make a hole in the soil (about the diameter of the spout) using whatever tool is at hand, such as a pen, pencil or knife. Insert the spout into the hole, and press firmly in. Simply pushing the spout into the soil can force dirt into the opening resulting in clogging and even worse, breaking of the globe especially if the soil is dry. The long cylindrical part of the watering globe can get clogged with soil debris. The interior of the globe can also grow mold and algae. Use warm water mixed with detergent to clean the watering globe. A combination of baking soda and lemon juice can also be effective in dislodging algae. Either make a solution then pour into the spout, or sprinkle the baking soda into the globe then pour in the lemon juice. Shake well to scrub out the dirt, mold and algae. In event the stem is clogged with dirt, pour warm water to loosen the dirt, then use a thin stick or straw to poke at the dirt, then pour more warm water and shake. Repeat the process as needed. If the plant shows signs of wilting that not solved by this watering system, it may be an indication the plant needs to be repotted.